Athlete and overall event safety is our first priority for the Mid-Atlantic CrossFit® Challenge. Meet your 2019 MACC medical staff. All of the complimentary offerings for athletes can be found at the bottom of this page as well. Kimberley Murray, RN, M.S. Welcome! I'm your MACC Medical Team Lead. I've been leading. I've volunteered on the Medical Team for 5 Regionals now and was Team Lead for the Atlantic Regionals and Clinic Lead in the East. I’ve been on the Games Medical Team in Carson and in Madison. 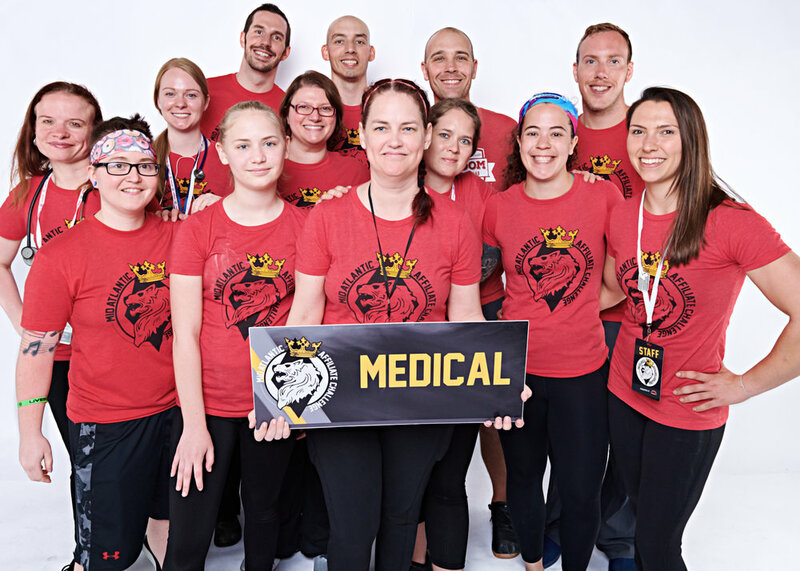 I've also done Medical for Wodapalooza, Working Wounded Games in D.C. and N.C. as well as many SuperFit competitions in the East including the National Championships. I'm an RN with a Masters in Clinical Leadership and enjoy working with our Adaptive Athletes. I look forward to serving our MACC athletes this weekend. Please take advantage of all our complimentary Services we provide with Mobility/Recovery/Taping/Ice or even First Aid and let me know if you need anything! Dr. Ryan Smith is a Doctor of Physical Therapy, COO of Recharge, Modern Health and Fitness, and a CrossFit Level One Trainer. William "Chip" Bleam III, D.C. is the owner of Freedom Chiropractic & Rehab in Eldersburg, MD. Over the past several years, he has obtained extensive training in the Graston Technique, Functional Dry Needling, SFMA, and FMS. He uses these techniques and many others to help the athletes around him get relief from pain so that they can continue to pursue their next event. Dr. Celine Caeran has been a physical therapist for 6 years primarily treating athletes of all ages and skill levels. A large part of what she loves to do is volunteer her time at Ironman/Triathlon events and road races doing pre-/post race stretching and injury screens on the athletes. She works at her local Box as a PT treating athletes and keeping everyone as healthy as possible. She was a member of the CF medical team last year at East Regionals and is excited to be apart of the MACC team this year. Dr. Meghan Wieser is a Doctor of Physical Therapy originally from NJ and moved to MD last summer to work for Recharge in Ellicott City, MD as a coach and physical therapist. Dr. Mark Daitol is a licensed physical therapist practicing in Barnegat, New Jersey. He is a member with Mathuin Athletics based in Deptford, New Jersey and has been CrossFitting for 3 years. He currently is enrolled in a Sports Residency program through Evidence in Motion (EIM) so that he can advance his knowledge and skill set to better serve his athletes. Michelle Bomyea, PT, DPT graduated from Marymount University with a Doctor of Physical Therapy and is currently practicing at Medstar Georgetown University Hospital Outpatient Facility. She is originally from a small town outside of the Adirondacks in NY and has a adorable pup named Lola. Dr. Antonio Perez-Duran, is originally from Puerto Rico, and is a practicing chiropractor in Arlington, VA. He is certified in Active Release Techniques and RockTape. Dr. Byron Lam is originally from Toronto ON, and is a Certified Chiropractic Sports Physician in the state of MD. He is certified by RockTape and a Certified Functional Strength Coach. He is excited to work with athletes and keep them at their best. Dr. Carson Aune, owner of Capital Sports Medicine, provides the DC Metro's athletes solutions to keep them pain-free and active so they can continue to compete and train without fear of re-injury or drops in performance. Dr. Carson, a Chiropractor and Physiotherapist, has extensive experience with sports medicine in many sports and has served on the Recovery Team for CF Regionals in the past. Following are the Complimentary Mobility and Recovery Offerings for all Athletes participating in the MACC this weekend: Please stop by either Medical Booth for your treatments, included in your registration fee. We also have 20 First Responders: 2 Athletic Trainers, 3 Physicians, 5 Paramedics, 5 EMTS, and 5 RNs, all Volunteering their time for First Aid treatment and emergency care if needed.